DULLES, Va.Nov. 11, 2015-- The U.S. Air Force and Orbital ATK (NYSE:OA) successfully conducted a ground level static fire test of the Medium-Class Stage III (MCS-III) solid rocket motor on November 5. This test was a demonstration of advanced technologies being studied for use in the forthcoming Air Force Ground-Based Strategic Deterrent (GBSD) system. The new advanced technologies demonstrated are important stepping stones for the future GBSD program, said Charlie Precourt, vice president and general manager of Orbital ATK s Propulsion Systems Division. This test of new propulsion technologies is a significant achievement for our company and the Air Force. Orbital ATK developed the high-performance upper stage motor for the MCS-III program. The objectives of the static fire test were to demonstrate an advanced strategic grade propellant, validate feasibility of motor thrust reversal/thrust termination system in a graphite epoxy case, and demonstrate a performance enhancing, vectorable nozzle with electro-mechanical thrust vector control. Preliminary test results indicate the motor performed within predictions. The Air Force plans to replace Minuteman III propulsion elements with a modern propulsion system as part of the GBSD program. 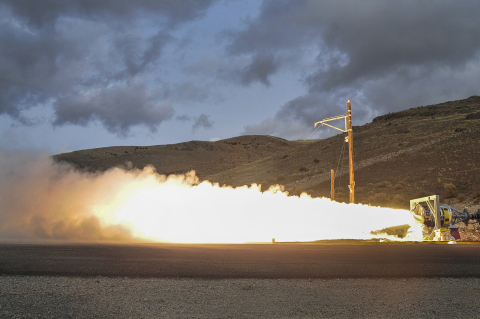 The Air Force is preparing for the upcoming development work by maturing and demonstrating available technologies in a medium-class solid rocket motor, applicable to the GBSD propulsion systems. Orbital ATK has a successful history of designing, fabricating, integrating, testing and delivering more than 3,800 motors in direct support of Department of Defense missions. Orbital ATK s medium-class stage motors could support multiple missions such as GBSD, Conventional Strike Missile and Operationally Responsive Space. The MCS-III program, which is managed by the Air Force Nuclear Weapons Center at Hill Air Force Base in Utah, is conducted under the Intercontinental Ballistic Missile Demonstration/Validation Propulsion Application Program funding to support the demonstration of technologies applicable to future strategic programs.